A website directly connected with your podcast episodes is one of the biggest steps you can take to building your audience and taking advantage of the full benefits of podcasting. 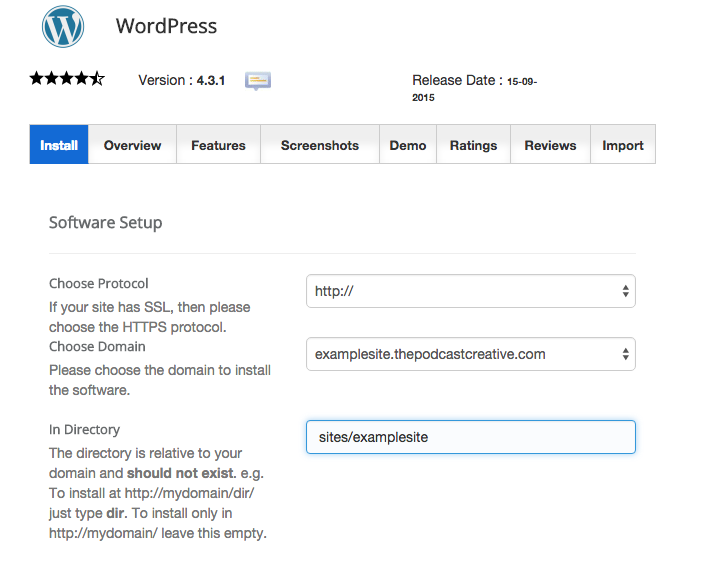 In this post we'll go over everything you need to know to set up your podcast website on WordPress. Do You Need a Podcast Website? All you need for your podcast to function is an RSS feed that links to your audio files. But having a website gives you a personal area to own and promote your content. If your podcast helps promote a product, organization, or the work you do in an industry, you're going to want somewhere to aggregate listeners and connect in more ways outside of just your podcast episode each week. Hopefully you're seeing the benefits of having a website for your podcast and even getting some ideas of how you could use one to grow your podcast. So let's get started and get your podcast website set up! There are two basic things you'll need for a website. Web hosting, where all the files for you website are stored, and the domain name, which gives you a human readable name associated with your website so they can be accessible. I've used Siteground for plenty of sites, and I couldn't be happier with their quality, features, and customer support. Since I'm most familiar with Siteground, I'll go through the steps of setting up a new site using their service. If you're a host other than Siteground, the steps will basically be the same for all web hosting companies that use cPanel(an administrator tool to manage your web server). 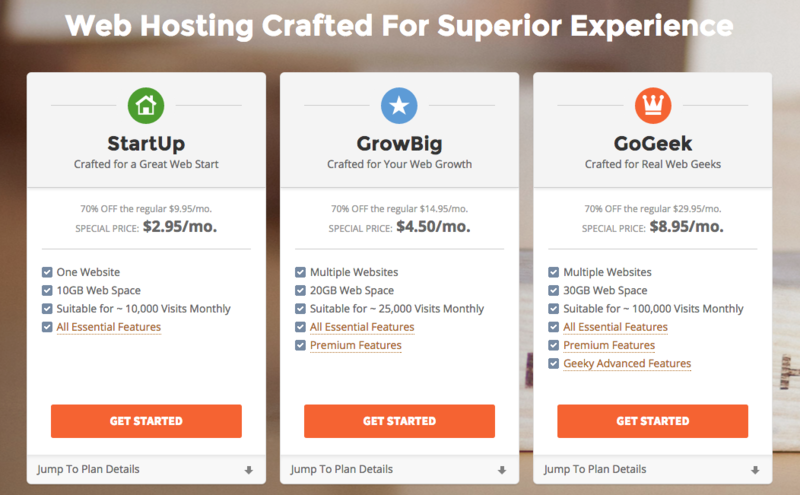 When you first get to the Siteground page, you'll need to choose the type of plan you want under shared hosting. I recommend starting with the "Startup" if you aren't sure which one because you can always upgrade later if you need to. At the time of writing, all Siteground plans come with a free domain for one year. So you can choose any available domain name you want and it will be a free addon to your order. You've just set up your web hosting and domain, you can go to the domain name that you chose, and you'll see some type of welcome message from the web host! Now we need to get the install and set up WordPress. If you're unfamiliar with WordPress, it is a free, powerful, and easy-to-use content management platform for websites. The primary reasons we're using WordPress are the infinite ways you can extend it's functionality and design by use of downloadable themes (design layouts for your site) and plugins (separate functionality applications that can easily be downloaded and attached to your website). If there is some type of functionality or element you are wanting for your website, 99% of the time there is already a WordPress plugin built that you can download and use on your site. All in all WordPress is amazing for entrepreneurs, startups, and podcasters. So let's download WordPress with your web host. I'll be using a subdomain that I created (examplesite.thepodcastcreative.com) so I can go through the setup steps with you. Go to your login page for your web hosting (siteground.com if you signed up with them) and click the login button and sign in using your credentials. Go to the "My Accounts" tab and then "Go to cPanel". It might be in a different place on your hosting provider. If it's not immediately visible from your homepage it will likely be under account management, or hosting management. 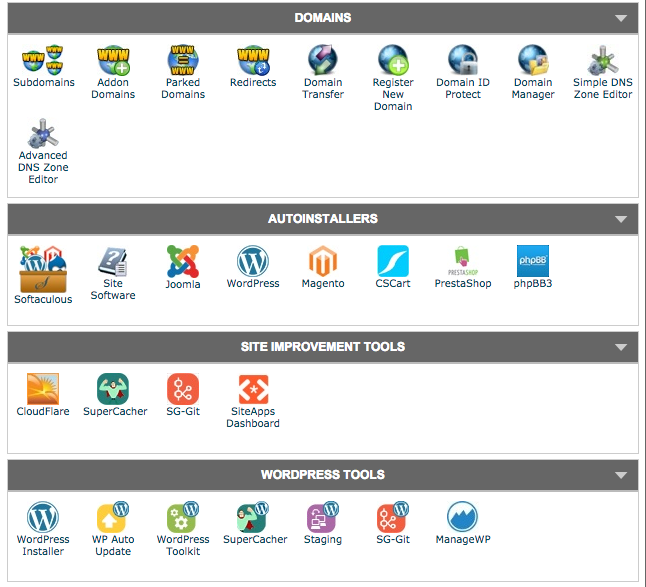 cPanel is where you can configure and control everything that has to do with your web hosting. 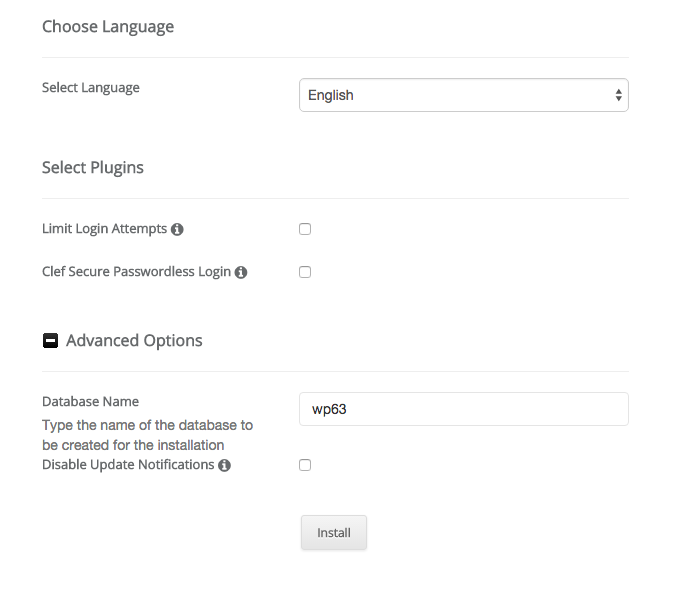 Scroll down to AutoInstallers or WordPress Tools (sometimes called One-Click Installs, or CMS Installs depending on your hosting) and click on WordPress. This will take you to the application download software used with your webhosting, in Sitegrounds case - Softaculous. Click the install tab, keep the protocol at 'http://', select the domain name for the site in the dropdown. You can leave the "In Directory" blank, this just means that your site files will be stored in the root folder of your web hosting directory. Go down to Database Settings. You can leave the Table Prefix. Add your site name and site description (you'll be able to change all of the site settings later within WordPress). Don't enable Multisite. Then set your admin username, password and email. Depending on the software installer, you'll have different options for plugins. I wouldn't install any plugins that they offer at this point, we can always do that from within WordPress. If you have advanced options, you can change the database name to a short name that makes sense for your site. This will just help with organization if you later want to add another WordPress site to your web hosting. Install - it might take a few minutes. When you get your confirmation of it finishing the download, click the link to your site or type in the URL in your browser search bar and you'll be taken to the WordPress site. Awesome, you've got a basic WordPress site! 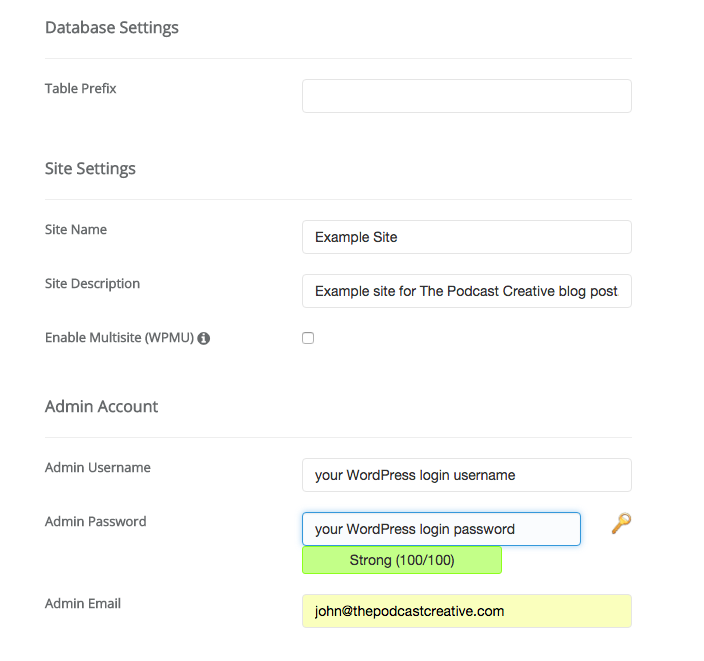 To log in to the admin of your WordPress site, go to www.yoursitename.com/wp-admin and enter your credentials. This will take you to your WP dashboard. The center section (the actual dashboard) can be customized and sections can be minimized using the small arrows in the top right of boxes. Where you'll do most of your work with your site is accessible through the menu column on the left. This will be a very short intro to the basics options, settings, and content types available in WordPress. For more information, I'd suggest looking into some beginner tutorials if you aren't very familiar with WordPress or taking our full online course Create and Launch Your Podcast Website which takes you step by step to successfully creating and launching your podcast website. Posts: Content type generally used as blog posts. Here you can create and edit them like you would work with a Word document. Posts are meant to be dynamic content that are added to regularly. Media: Manage images, audio, and video. Pages: Pages on your website. These are meant for static content. For example, an about or ontact page. Comments: View, approve, set as spam, and delete comments from this page. Appearance: Theme settings and widgets (specific areas of functionality on your site that vary from theme to theme). Plugins: Add and manage plugins to your site. Users: Users and user permissions. Tools: As you add plugins some of the settings will become available here. Settings: General settings for your website. Think of themes as the design and structure of your website. Go to Appearance > Themes and you'll see that your site automatically comes with some default themes included by WordPress. To add a new themes you can click the "add new" box and it will take you to the repository of free themes available on WordPress. If you want a different design or a theme with more built-in functionality, there are literally thousands of paid themes available through third-party marketplaces. Themeforest is one of them. But just like with plugins, but be sure to look carefully at reviews and ratings before buying one. I personally had good experiences using StudioPress Themes built on the Genesis framework. Genesis themes are very powerful themes but note you'll need to buy the Genesis framework along with the actual theme that goes on top of it. If you're interested in the Genesis framework and StudioPress themes, you can learn more about its features and benefits. Plugins are used to extend and add functionality to your WordPress site and are one of the key features that make WordPress great. To add a new plugin, go to the Plugins link in the left menu, then click Add New. From here you can search for plugins, read the descriptions, faqs, reviews, etc. and then download them with one click directly into your site. Akismet: Spam filtering for comments. Wordfence: Security for your website. Yoast SEO: Search Engine Optimization tools. You should also look into plugins that fit your specific needs such as forms, newsletter integration, social media integration, image galleries, or anything else you might need. To truly make your website a podcast website you'll need to fully integrate your podcast with a plugin. The plugin that will work best for you will depend on which podcast media host you're using. If you're on the fence on which to choose, just download both plugins and see how you like the interface, then delete the one you don't want. You've got a WordPress Podcast Website! If you've followed the steps of this blog post you now have the basics of a WordPress website for your podcast. Now you can look into different themes and plugins to get your site just how you want it with the features you need to grow. If it seems like a lot to grasp at first, don't worry, everyone starts off somewhere and once you get the hang of it you'll have the control you need to reach your full potential with your podcast website. If you'd like a full in-depth, step-by-step videos taking you through the process of creating, building, and successfully launching your podcast website, check out my podcast website course.